Composed as a geographical tone poem, Michigan follows a metaphysical expedition through the idiosyncrasies of middle America. Drawing from personal anecdote, regional history, and state heritage, Stevens mixes social and political grievances with songs about snowmobiles, Henry Ford, the Detroit race riots, and love. Guest artists include Elin, Megan, and Daniel Smith (of The Danielson Famile), and John Ringhofer (Half-handed Cloud). Album art features original hand-paintings by Martha Stewart crafts editor Laura Normandin. 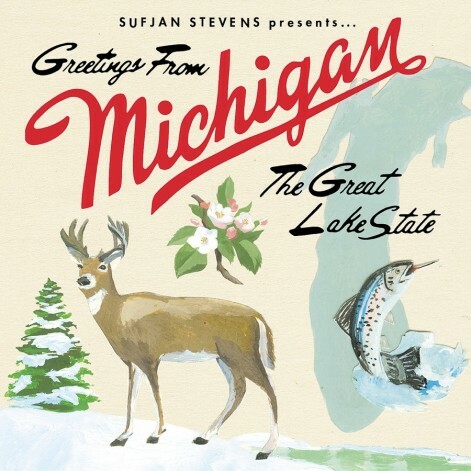 Michigan is the inaugural entry of THE 50 STATES, a cumulative recording project by Sufjan Stevens unparalleled in its panoramic enterprise: a record for each state! You think he’s kidding, don’t you?